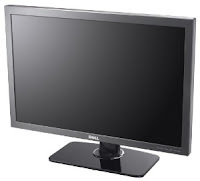 If you're building your own PC and making it High Definition ready, then you might want to check out the Dell UltraSharp 3008WFP which is the latest 30 inch LCD monitor from dell that has a variety of input connectivity. The Dell UltraSharp 3008WFP has TrueColor WQXGA display with 2560 x 1600 resolution, perfect for viewing HD movies. It is also the first LCD monitor which has the DisplayPort technology, something which is sort of a replacement for DVI. The Dell UltraSharp 3008WFP has an 8ms response time, 3000:1 contrast ratio and vast connectivity options like DisplayPort, HDMI, DVI-D, VGA, S-Video and Component and Composite connectors. In addition the Dell UltraSharp 3008WFP also includes a 9-in-2 media card reader for instant viewing of photos stored in media cards, and four USB 2.0 ports. The Dell UltraSharp 3008WFP is already available now with a price of $1,999.